We are again today reminded of the inextricable link between the Incarnation and the suffering and death of Jesus: in today’s Gospel we hear about the massacre of the Holy Innocents. We remember today those killed by King Herod in his effort to find and destroy the Christ child. How many were killed in Herod’s determination to kill all who resembled Jesus in gender and age is unknown; the estimate ranges from 10,000 to a few dozen. Herod’s act reminds us of the allure and temptation of the power of this world. King Herod reigned for 33 years. He was a Jew, so he knew that God promised to send a Messiah. Perhaps there had been a time in his life when that was something he looked forward to, when he waited in joyful hope for the coming of the Messiah.. But by the time the Magi visit him, Herod had gotten pretty comfortable. He was Herod the Great, king of the Jews. He was the most powerful man in his part of the world. People bowed in his presence. He was in complete control. And he grew to like that. And so Herod took whatever steps he thought were necessary to keep it that way, including killing his brothers and half-brothers – anyone who could have challenged his reign. He would do anything to maintain his position as King of the Jews. As a result, when Herod hears tell of the birth of a baby who was born King of the Jews, he doesn’t rejoice at the coming of the Messiah, but is threatened. Herod had no intention of giving up his kingship for anyone else. Fearing for his loss of position, he engineers the massacre of the innocents. Our temptations don’t tend to lead us to actions as depraved as Herod’s. But we are no less susceptible to the temptations of the world than he was. And so the reminder of where that temptation can lead is a good one as we move toward the beginning of a new year. It is true that today is the feast of St. John the Evangelist, so both Mass readings come from John: a beautiful passage from the First Letter of John as the first reading, and this Gospel reading from the penultimate chapter of John’s Gospel. More than that, however, it is actually fitting that we hear the story of the empty tomb two days after Christmas. Today’s Gospel is an important reminder that the Christian story is a unitary one: A story that begins with Incarnation and ends with death and resurrection. Our beautiful Nativity scenes are merely Act I of a play that cannot be fully appreciated unless we apprehend it in its entirety. God’s taking human form in the world inevitably leads to the cross. From the moment of his birth, Jesus is destined to die. But then, when all hope seems lost, the tomb is empty. Jesus rises from the dead, making resurrection a reality for us. The story whose beginning we celebrate in this Christmas season ends with victory over death. That is the Christian story. And we who know the entirety of the story are tasked with sharing it with others – with bringing the hope of resurrection to a wounded and suffering world. Today we celebrate the audacious claim that through the love of God, the Word became flesh. That God’s longing for us is so great God became human to bring us to wholeness. God becomes human and shares our lives in the deepest, most intimate possible way. 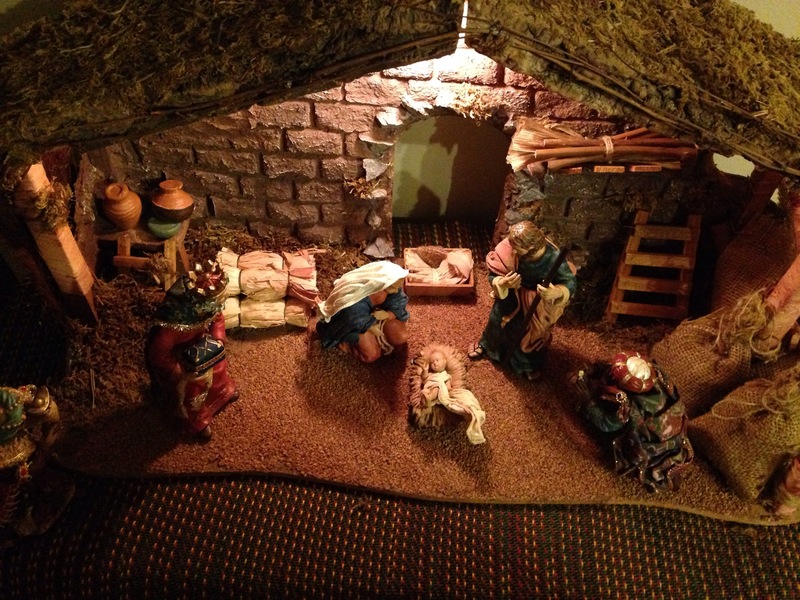 The Incarnation invites – nay, demands – a response from us. So as we kneel before the creche this morning, we might want to reflect on what that response is. Today we begin the Octave before Christmas Eve. For some of us, Christmas can’t get here quickly enough. For others of us, the shock that Advent is almost over is palpable. The pastor in my parish observed yesterday that if you haven’t yet gotten serious about your Advent resolutions, you are running out of time. If the beginning of the story involved as many sinners as saints, so has the sequence. This means not simply a Peter who denied Jesus or a Paul who persecuted him, but sinners and saints among those who would bear his name throughout the ages. If we realize that human beings have been empowered to preserve, proclaim, and convey the salvation brought by Jesus Christ throughout ongoing history, the genealogy of the sequence of Jesus contains as peculiar an assortment of people as did the genealogy of the beginnings. The God who wrote the beginnings with crooked lines also writes the sequence with crooked lines, and some of those lines are our own lives and witness. A God who did not hesitate to use the scheming as well as the noble, the impure as well as the pure, men to whom the world hearkened and women upon whom the world frowned – this God continue to work through the same mélange. If it was a challenge to recognize in the last part of Matthew’s genealogy that totally unknown people were part of the story of Jesus Christ, it may be a greater challenge to recognize that the unknown characters of today are an essential part of the sequence. A sense of being unimportant and too insignificant to contribute to the continuation of the story of Jesus Christ in the world is belied by the genealogy. The reading we hear today at Mass – this beginning of St. Matthew’s Gospel – not only reminds us of God’s fidelity, but strengthens our hope about our destiny and our importance to God’s plan. It is an invitation offered to all of us. As Brown suggests, if the story of the origin of Jesus Christ is that “Abraham was the father of Isaac, who was the father of Jacob, who was the father of Judah and his brothers,” then the continuation sequence is that Jesus called Peter and Paul, Paul called Timothy, and that somewhere along the way someone called you and me and that we all must call others. We are all part of the ongoing genealogy of Jesus Christ.